Robert Toth and his newest project, a sculpture of Daniel Boone: the beginning sculpture and the finished piece. Photo by Sarah Enfiedjian / Salisbury Post. One might think that at some point an artist as successful as Robert Toth would want to slow down a bit and take it easy. He shows no sign of slowing down - his art gives him energy and keeps him young. For Toth, creativity is life. His fertile imagination supplies a seemingly endless supply of creative ideas that he works diligently - and joyfully - to see to fruitation. Known for his painting and sculpture, Toth recently completed a sculpture of Daniel Boone to add to his growing Masters Collection, which pays tribute to those who have inspired others. The series include people Toth admires, such as Thomas Edison, Benjamin Franklin, and Maria Montessori. the Yadkin River, Toth says. For his likeness of Boone, Toth used the only known portrait painting of Boone, done by Chester Harding, who made the journey into the backwoods of Missouri in 1820, near the end of Boone's life. Boone was in poor health at the time the portrait was made, so Toth has chosen in his version to depict a more vibrant and robust version of Boone. 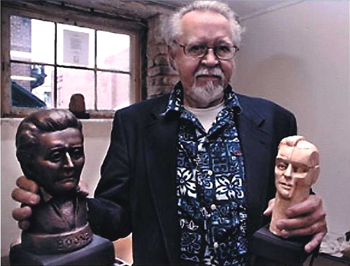 Toth's sculpture busts of Boone and others are available at Fine Frame Gallery, 105 S. Main St.
Toth wants to be someone who, like those in his Master series, inspires others. He is putting together an instructional DVD series called Art and Creativity in order to share with aspiring artists the skill that he's acquired over his many years as a sculptor. Robert Toth's newest sculpture of Daniel Boone and how he created this sculpture. Photo by Sarah Enfiedjian / Salisbury Post. So far, six different DVDs are in the works. One, with a focus on creating abstract art, is available at Waterworks Visual Arts Center. The whole series will soon be available for purchase at www.JGMediaLLC.com. 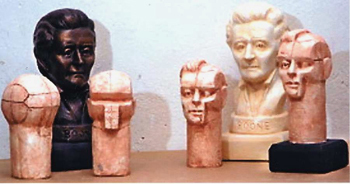 One of the DVDs focuses on basic head construction, showing stages of development of a portrait that build up to the finished likeness of Daniel Boone. Clips of that can be found on YouTube (do a search for Robert Toth). He's planning to teach a class locally called Art and Creativity that will focus on basic head construction. Toth hopes to make a DVD series avaliable to schools and libraries. 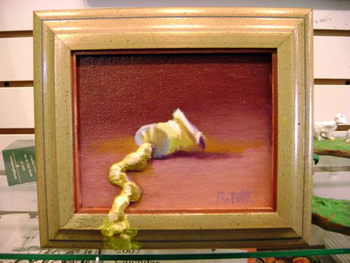 The Wizard of Ooze: Toth's three dimensional "Oozing' series plays with viewers' expectations. Photo by Sarah Enfiedjian / Salisbury Post. Toth has also been hard at work - although he might describe it as play - on a series of paintings he calls his "Oozing Series," avaliable at the Fine Frame Gallery and on his web site, www.RobertToth.com. The three-dimensional series is a departure from his academic work. One of the works depicts a hand squeezing a tube of oil paint on to a palette. 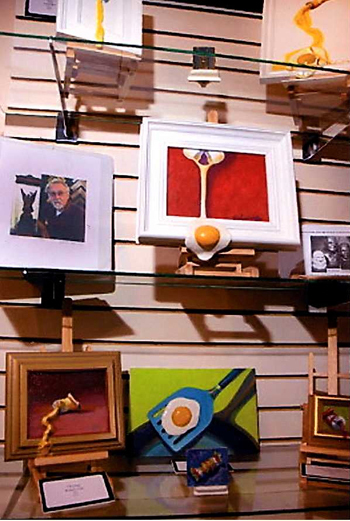 Other works feature fried eggs. Clearly, he's having fun with the pieces, which invite people in, he says. "Does art have to be so deep all the time?" he asks. He loves when his art provokes a reaction from people. "That's my reward," he says. Toth will have a book signing at 2 p.m. Saturday at the Literary BookPost. His signed and numbered collection of original drawings of Rowan County - more than 150 drawings on parchment - will be avaliable for $37.50, as well as copies of his 2008 calendar. The book can also be purchased at The Rowan County Convention and Visitors Bureau, as well as at A Step in Time, Queen's Gifts, Salisbury Square Antiques, and the Waterworks Visual Arts Center. Robert Toth's Oozing series. Photo by Sarah Enfiedjian / Salisbury Post.